Chonburi selected its participant in the coming Miss Grand Thailand beauty pageant at the provincial finals in Pattaya. Sudaporn “Amm” Wongsasiripat, 23, a graduate of the Faculty of Political Science at Ramkhamhaeng University Bangkok, won the March 26 Miss Grand Chonburi contest and will compete in the Miss Grand Thailand pageant later this year. She won 30,000 baht cash and 30,000 baht in Colly Cally cosmetics. She also will spend the next year as the company’s brand ambassador. 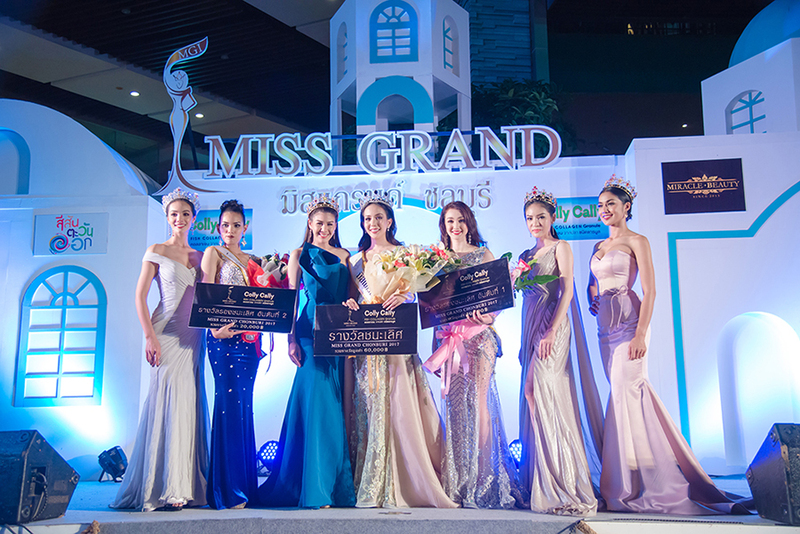 Miss Grand Chonburi winner Sudaporn “Amm” Wongsasiripat (center) is congratulated by runners-up and past champions. Sofo Yarkiger placed second, sinning 40,000 baht in cash and cosmetics with Meenpicha Laoarun finishing third for 20,000 baht cash and prizes. Sudaporn also won the Miss Healthy Skin award. Sudaporn, an Elite Model, is 173cm tall, speaks English, and is a standout in Manohra and Thai Dance. She was one of 40 finalists for Miss Universe Thailand 2014. She is from Chonburi and will be representing the province for the Miss Grand Thailand pageant from 24 June – 3 July 2017 at the Shanghai Mansion, Bangkok Hotel. The pageant at Central Festival Pattaya Beach was judged by a panel of 12 and included evening gown, swimsuit and interview contests. Past champions cheers on the finalists. The pageant at Central Festival Pattaya Beach included a swimsuit contest.